Full length protein, corresponding to amino acids 1-256 of Human NSMCE1 (AAH18938.3). Lysate from 293T cells transfected with NSMCE1; HeLa cells. Our Abpromise guarantee covers the use of ab168578 in the following tested applications. WB Use a concentration of 1 µg/ml. Predicted molecular weight: 30 kDa. NSMCE1 is a probable component of the SMC5-SMC6 complex, a complex involved in DNA double strand breaks by homologous recombination. The complex may promote sister chromatid homologous recombination by recruiting the SMC1-SMC3 cohesin complex to double strand breaks. 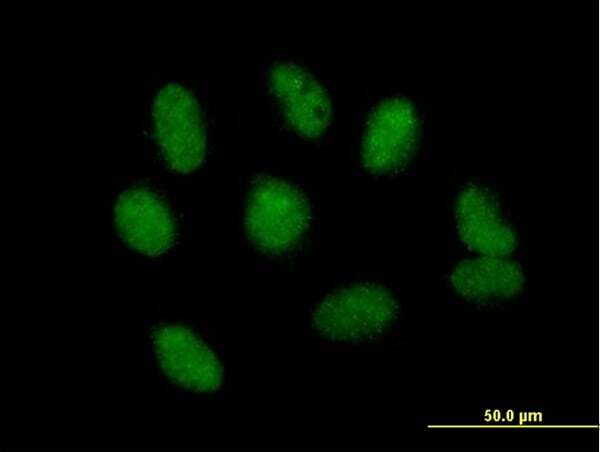 Immunofluorescence analysis of paraformaldehyde-fixed HeLa cells, labeling NSMCE1 using ab168578 at 10 µg/ml. ab168578 has not yet been referenced specifically in any publications. Publishing research using ab168578? Please let us know so that we can cite the reference in this datasheet. There are currently no Customer reviews or Questions for ab168578.